The Fifth Money Laundering Directive (5MLD) has an implementation date of January 2020, with the aim of addressing a number of weaknesses that have come to light since the introduction of the Fourth Money Laundering Directive (4MLD) on 26th June 2017. Here, encompass adviser Dr Henry Balani, a financial services expert and academic, examines the key developments within the latest directive and what they will mean. what is 5MLD and how is it different from previous anti-money laundering directives? 5MLD represents the latest update to the Anti-Money Laundering (AML) directives put out by the European Union (EU). Like those before it, its goal is to stay current and on top of changes in money laundering techniques that criminal actors have been adopting. Financial crime continues in whatever form is available to these bad actors, and regulators need to adapt to these changing circumstances with new updates. 5MLD is especially pressing, given the high-profile terrorist attacks in Paris and Brussels in 2015 and 2016 respectively. In both cases, terrorists used non-conventional techniques to finance their criminal activity, including the use of pre-paid cards, which under 4MLD was not adequately covered for potential money laundering abuse. The Panama Papers leak in early 2016 also highlighted the shadowy nature of how corporations can hide the true owners of shell companies that are used for illicit activities. There are several major updates that distinguish 5MLD from 4MLD, with the first clarifying the definition of a Politically Exposed Person (PEP). By virtue of their positions, PEPs are more susceptible to corruption, given their government role and influence. Corruption is a predicate crime to money laundering, and financial institutions have to conduct enhanced due diligence on their PEP customers due to this increased risk. Previously, there was no clear definition of a PEP – for example, while the Mayor of London is a PEP, what about the Lord Mayor? How about a Mayor of a small village in Spain? To achieve some level of consistency, member states will now need to maintain a list of prominent public functions that Obliged Entities (OE) – institutions that are required to comply with the Money Laundering Directives – like financial organisations, can then use to develop their due diligence procedures. While this change is a step in the right direction, there are still challenges, which are largely due to the inconsistent definitions of these functions, especially across all the different EU member states. The second update relates to information sharing by EU member states’ Financial Intelligence Units (FIU). FIUs are tasked with identifying potential money laundering activity based on information received by financial institutions that report suspicious activity. Sharing information across member states helps improve criminal activity detection, especially when these criminal activities move across borders. 5MLD requires member states to set up centralised bank account registers to identify account holders, including the Ultimate Beneficial Owners (UBO) of these accounts. Ultimately, OEs will need to be able to set up efficient processes to share their customer account information with the FIUs. The Paris and Brussels attacks have heightened the role of law enforcement in identifying terrorists, which results in these agencies requesting customer account information without the need for suspicious activity reports (SARs). Previously, law enforcement agencies would only act on potential money laundering suspicions based on the filing of SARs by OEs. However, 5MLD now allows law enforcement agencies the ability to track potential terrorists without these SARs. OEs will need to be able to provide timely, accurate and relevant customer account information as needed. Another significant update within 5MLD relates to the need for additional transparency related to identifying UBOs of corporations. The Panama Papers leak made clear that many shell companies were used for both legitimate and nefarious business transactions. Shell companies make it easy to ‘hide’ assets of corrupt government officials (PEPs). The Prime Minister of Iceland is one prominent PEP uncovered in the Panama Papers leak, resulting in his removal due to less than transparent financial transactions. Under 5MLD, member states will be required to identify beneficial owners and to maintain public registers of these. The result of such public registers is an increase in transparency, making it more challenging to disguise illicit transactions including terrorism and money laundering. The rise of new financial technologies has provided consumers greater choice and flexibility in conducting financial transactions across borders. An example is the introduction of cryptocurrency, including bitcoins. Virtual currency exchanges and custodian wallet providers have now sprung up to service consumers. However, criminals also take advantage of these financial technologies. The innovation from cryptocurrency requires regulations to prevent widespread abuse. 5MLD changes requires virtual currency exchanges to screen their customers for potential money laundering. Banks will also now need to screen these virtual currency exchanges as well, including their customers. Cryptocurrency already holds great promise when it comes to driving greater efficiency and lowering costs for cross-border transactions, and the 5MLD requirements can help in greater adoption of this new technology. Other innovations in financial technology have also resulted in the greater use of pre-paid cards. Unfortunately, post analysis of the Paris and Brussels attacks revealed that the terrorists financed their activities using these prepaid cards. These anonymous instruments made it easy for them to disguise their identities, consequently meaning it was difficult for law enforcement agencies to track their financing operations. As a direct result of these attacks, 5MLD now lowers the identification threshold of these prepaid cards to over €150 (down from €250), with any remote payment transactions over €50. Any institution selling prepaid cards will need to conduct due diligence checks on their customers to identify suspicious transactions. It is clear that technology innovation and new payments processes are driving greater ease of use in financial transactions globally. While they benefit the general public, bad actors will always be looking to take advantage of these trends to finance their illicit activities. 5MLD represents a significant step forward in addressing these loopholes. However, technology change especially in financial services continues to accelerate. 6MLD is already in discussion amongst EU regulators. And it is clearer than ever that there is a need make it count if we are to stay vigilant and on top of the never-ending fight against money laundering and terrorism. Dr. Balani will be taking a deeper look into the 5th Money Laundering Directive changes and the associated issues during a webinar on April 25. Book your place today to hear more. Dr. Henry Balani is currently Principal at Blockchain Advisory Institute, where he advises companies on using the Blockchain to drive innovation in the real estate and the financial services sector. 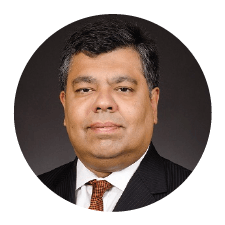 Dr. Balani is a noted industry commentator on issues leveraging the Blockchain, Digital Assets, Sanctions and Regulatory Compliance. As a published academic, Dr. Balani also lectures on international business, economics and regulatory compliance courses globally. At Accuity, a division of the RELX Group (formerly Reed Elsevier) he was responsible for driving Blockchain partnerships and thought leadership in the financial services industry. Dr. Balani holds a Doctorate in Business Administration from the University of Wisconsin, an M.B.A. from Northern Illinois University in the USA and B.S. in Economics, International Trade and Development from the London School of Economics. Connect with Dr. Balani on LinkedIn and Twitter.